Thinking about saving some money this year by making your own Halloween costume? Want to create something lively and original using easy-to-find household items or craft store supplies? Always fancied yourself a fan of all things avian? Then just maybe a goose costume is right for you. The creation process makes for a fun afternoon and when finished, others will surely “flock” to you with compliments. Find an old white poncho at a secondhand store and cut it to the length you want your goose wings to be. If you want to make the wings more complex, cut out the part of the poncho that would cover your chest and cut small holes in the sides as far down as you can. These will be for the wearer's middle finger to slip through to hold the wings over his arms. Lay the poncho flat over a hard surface. Poke the shafts of the faux feathers through the fabric so the feathers stick in it. Most faux feathers have strong shafts, so they should poke right through; but if the fabric is especially thick, you may need to make small cuts in the poncho to stick the feathers in. Spread the feathers out over the poncho so there is a feather or two every 6 inches. You do not need to cover the whole poncho unless you really have the time and patience. Turn the poncho over so you can see the shafts of the feathers. Use the hot glue gun to adhere each feather to the poncho. This will be the underside of the wings, so you do not need to be particular about the appearance of the glue. However, attempt to position the shafts so that the feathers will point downward when they are affixed. Allow the glue to set. 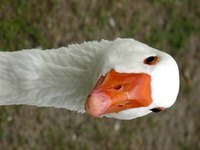 Paint a party hat from a party supply store with bright orange acrylic paint to use as the goose's beak. Hats that have no pattern on them can be painted more easily. If you cannot acquire a party hat, make a cone out of cardstock and staple it together. Attach a rubber band around the bottom to hold the beak on. Allow the paint to dry between coats. Wear a plain white shirt and white pants or shorts. Put on orange or buy an inexpensive pair of white shoes and paint them orange. Put the poncho on over your shirt and wear the party hat over your mouth. Use a poncho or shawl that has fringing on the edges so the wings look more like feathers. If you have white shorts for the outfit, find some orange tights to wear for the goose's bright orange legs.